Pecan Pie combines a crisp and buttery pastry with a deliciously rich, sweet, dense, and chewy filling that is loaded with toasted pecans. 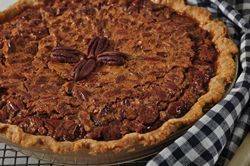 Along with pumpkin pie, Pecan Pie is a staple at most Thanksgiving tables. It is perfect on its own or with a dollop of whipped cream or a scoop of vanilla ice cream. All pies begin with a pastry crust and while there are many choices, my personal favorite is this Pate Brisee (short crust pastry) recipe. I like its crumbly texture and wonderful buttery flavor that complements the sweet filling. Some recipes do call for pre-baking the crust and you can do that, but I find this step can be eliminated if you simply bake the pie in the lower third of the oven. You will, however, need to watch for over browning on the edges of the crust, and if this starts to happen, just cover the edges with foil. Pecan Pie is, of course, all about the filling. The pecans are toasted first to enhance their flavor and since I like pieces of nuts, rather than whole ones, I have chopped the pecans coarsely. If you want to give the baked pie a more decorative look, place whole pecans around the outside edge of the pie after the pie has been in the oven for a few minutes. Now, this recipe is one I adapted from John Thorne's excellent book "Outlaw Cook". I love how his recipe uses Lyle's Golden Syrup in the filling, rather than the more commonly used corn syrup. Lyle's Golden Syrup is a British sugarcane syrup that is thick like molasses, amber colored, with a rich delicate flavor. Using this syrup, instead of corn syrup, keeps the pecan pie sweet but not cloyingly so. You can usually find this product in some grocery stores or else in specialty stores or on the net. If you cannot find it, you can use either dark corn syrup or a combination of corn syrup and unsulfured molasses. Besides the syrup, the filling is also sweetened with dark brown sugar along with a splash of rum (or bourbon) to balance the sweetness and to accent all the pie's flavors. If you do not want to use alcohol in the filling, simply substitute the rum with 1 teaspoon of pure vanilla extract. Just be sure to add the vanilla along with the eggs. John Thorne does tell us to heat the filling ingredients to boiling and this step gives the filling a wonderful dense texture. If you prefer a pie with a softer filling, omit this step and just mix all the ingredients together without heating them. Once the filling is made it is poured over the chopped pecans and baked in a moderate oven just until the filling has set. After baking, place on a wire rack to cool. There are some that must have chocolate with their pecan pie. If that is the case, you can drizzle melted chocolate over the baked and cooled pie. Simply melt one ounce (30 grams) of semi sweet or bittersweet chocolate in your microwave or in a heatproof bowl set over a saucepan of simmering water. Once the chocolate has melted add 1 tablespoon of cream and a splash of rum, if desired. Then drizzle or pipe the chocolate and cream mixture over the top of the baked and cooled pie. Pour 1/8 cup (30 ml) water in a slow, steady stream, through the feed tube until the dough just holds together when pinched. If necessary, add more water. Do not process more than 30 seconds. Turn the dough onto your work surface and gather into a ball. Flatten into a disk, cover with plastic wrap, and refrigerate for 30 minutes to one hour before using. This will chill the butter and relax the gluten in the flour. After the dough has chilled sufficiently, place on a lightly floured surface, and roll into a 13 inch (33 cm) circle. (To prevent the pastry from sticking to the counter and to ensure uniform thickness, keep lifting up and turning the pastry a quarter turn as you roll (always roll from the center of the pastry outwards).) Fold the dough in half and gently transfer to a 9 inch (23 cm) pie pan. Brush off any excess flour and tuck the overhanging pastry under itself. Use a fork to make a decorative border or else crimp the edges using your fingers. Refrigerate the pastry, covered with plastic wrap, for about 30 minutes before pouring in the filling. Preheat oven to 350 degrees F (180 degrees C). Place the oven rack in the bottom third of the oven. Make the Pecan Filling: In a large saucepan, heat the brown sugar, Lyle's Golden Syrup, rum, and butter until boiling, stirring constantly. Remove from heat and let cool until lukewarm. Meanwhile, in a separate bowl, whisk the eggs. When the boiled syrup has cooled, beat in the eggs, salt, and cream. Remove the chilled pastry crust from the refrigerator and evenly distribute the chopped pecans over the bottom of the crust. Then pour the filling evenly over the nuts. Bake for about 45 to 50 minutes, or until the filling is just set (a toothpick inserted into the center of the pie will come out clean. (If you find the edges of the pie crust are over browning during baking, cover with foil.) Remove from oven and place on a wire rack to cool. Serve warm or at room temperature with whipping cream. Note: To toast pecans - Place pecans on a baking sheet and bake for about 8 minutes in a 350 degree F (180 degree C) oven until lightly browned and fragrant. Let cool and then chop coarsely. Make the Maple Whipped Cream: Place the heavy whipping cream and maple syrup in bowl of your electric mixer. With the whisk attachment, whip the cream until soft peaks form. Barker, Karen. 'Sweet Stuff'. The University of North Carolina Press. Chapel Hill: 2004. Thorne, John and Lewis Thorne, Matt. 'Outlaw Cook'. Farrar Straus Giroux. New York: 1992.